They always talk about "Russian threat". Sounding eerily familiar are US and NATO justifications for their continued expansion east and escalations made against Russia today. And also like that other ambitious power, the United States has waged wars all across the planet, far from Russia’s borders and with little to do with Russia’s interests beyond its borders, long before it turned its sights on Moscow. Since World War II, the United States has invaded, bombed, and/or occupied the Korean Peninsula, Vietnam, Cambodia, Laos, Somalia, Lebanon, Yugoslavia, Iraq, Afghanistan, Libya, and Syria. Some of these nations have been attacked by the US more than once. In many more countries the US has facilitated the violent overthrow of various governments, particularly in South America and the Middle East, first through the use of its Central Intelligence Agency (CIA), then through more veiled organizations like the National Endowment for Democracy (NED). It has troops stationed in over a hundred nations around the world, occupying hundreds of military installations. More recently, the US State Department’s Victoria Nuland was recorded talking with the US Ambassador to Ukraine, literally handpicking the regime that would take the place of the government they helped overthrow. Just recently, the New York Times admits that the West is intentionally rigging global oil prices to undermine Russia. Such provocations are not the work of nations seeking peace or to deescalate tensions, but insidious provocations meant to continue to goad perceived enemies into reacting so as to then disingenuously cite additional “threats” that require additional “collective defense.” And so, over the cliff such interests lead the entire Western World. Historically, a nation maintaining such a posture is known as an “imperialist.” Imperialists maintain a variety of tricks to make their aspirations for global hegemony appear as a series of reluctant moves made in its own defense, or the defense of others. The United States in particular has refined this strategy to include the “defense of democracy” around the world, intervening where it claims there are deficiencies. Even as it claims Russia is the aggressor in Ukraine, it has not only claimed the need to back mobs in Kiev earlier in the overthrow of an already elected government for the sake of “democracy,” it also claims the Moscow itself suffers from a deficit of democracy – meaning that the destabilization and chaos the US has unleashed in Ukraine will eventually be visited upon Russia. Russia, apparently, is expected to simply wait until that happens. Not surprisingly, Russia has instead decided to defend itself. Historians would remind the people of present the final outcome of Adolf Hitler’s use of “collective defense” to invade its neighbor to the east. The war would cost tens of millions their lives and Germany itself would be decimated and divided for decades afterward, undertaking a painful process of reconstruction, reconciliation, and retribution for the crimes it had committed against humanity. For the German people themselves, they paid the highest price for the crimes of but a handful of special interests. Some of those special interests, particularly the Nazi Party, were liquidated entirely. Others, including bankers and industrialists who empowered and enriched themselves during the rule of the Nazis – including many American companies – escaped with absolute impunity and are to this day profiteering from new wars they tacitly support from the background through “think tanks” they fund producing policy papers that eventually transform into bills, declarations of war, and talking points featured on the nightly news. History needs not repeat itself. People can just as easily reject arguments made for “collective defense” as such arguments are made. 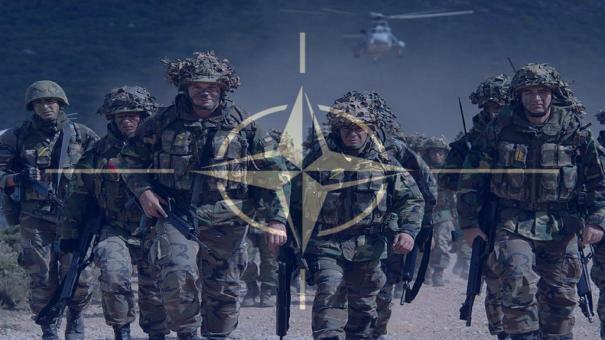 NATO will not fight a war without soldiers. Already in its proxy war with Russia in Ukraine, it has found few willing to subject themselves as pawns in this game. Ukrainians are ironically seeking shelter in Russia, not from “Kremlin backed rebels,” but from recruiters in Kiev seeking more young men to feed into a war of aggression precipitated by foreign interests. By simply spreading the word the trenches are dug that tangle the treads of this machine as it creeps forward.